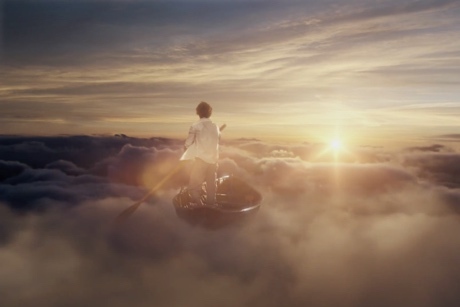 This week, Pink Floyd will release their album The Endless River. Ahead of the November 11 release date via Columbia Records, the band have shared the album in full and given the track "Louder Than Words" its own video. "Louder Than Words" is the only song on the predominantly instrumental album to feature vocals. The video shows the cloud-boater from the album cover, plus footage of Pink Floyd from the recording sessions (both the original early-'90s sessions and the more recent touch-ups), and some shots from the dried up Aral Sea. It was directed by Po Powell. Watch the video below [via Rolling Stone]. Also below, Spotify users can hear the entire 18-song album. It was recorded primarily during 1993 and 1994 with guitarist David Gilmour, drummer Nick Mason and (now-deceased) keyboardist Rick Wright. The album was produced by Gilmour, Phil Manzanera, Youth and Andy Jackson.